Balanites aegyptiaca (Linn.) Del, Ximenia aegyptiaca L., Agialida aegyptiaca (L.) O. Kuntze, Balanites roxburghii Planch., Agialida aegyptiaca Kuntze, Balanites racemosa Chiov., Balanites ferox G. Don. (USDA, 2009). The desert date tree (Balanites aegyptiacus (L.) Delile) is a deep-rooted, evergreen or semi-deciduous tree, up to 12 m high. The thorns, up to 8 cm long, are soft at first and later become woody (Ecoport, 2009). 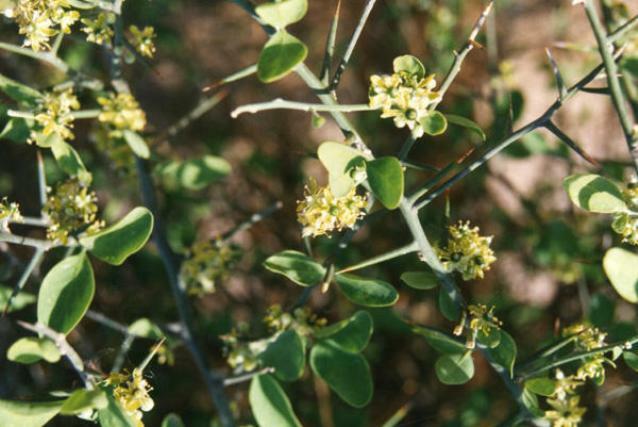 Leaves are bi-foliolate and spirally arranged on the shoots, dark green or grey-green, fleshy succulent with 2 firm coriaceous leaflets. The fruit is an ellipsoid drupe, about 2.5-4 cm long and 1.2 cm in diameter. The ripe fruit is brown or pale brown to yellow and resembles a small date. Balanites aegyptiacus is an important species in dry areas in Africa. Fruits and young shoots are edible. Ripe fruits are picked for their bitter-sweet flesh. Oil, used for frying, is extracted from the kernels. Fresh new shoots may be cooked with leaves like cabbage during drought and periods of food scarcity. The leaves and fruits are also widely consumed by animals. Balanites aegyptiacus is indigenous to African woodlands along the Sahara southern border. It occurs in a wide ecological range, including the Saharan, Sahelian and Sudanian zones, and can also be found further south, down as far as Katanga and Tanzania. It is commonly seen in Israel, Jordan, the Arabian Peninsula, and the drier parts of Pakistan and India. It is cultivated in Cape Verde, the Dominican Republic and Puerto Rico (Orwa et al., 2009). It is very tolerant to drought and thrives with an annual rainfall of 200 mm, or less where there is an additional water supply (e.g. banks of the Nile in Sudan). It spreads from the margin of the desert to the woody savannahs with up to 900 mm of annual rainfall (FAO, 2009). It prefers deep sandy loam soils and uninterrupted access to water such as valley floors, riverbanks or the foot of rocky slopes (Orwa et al., 2009). 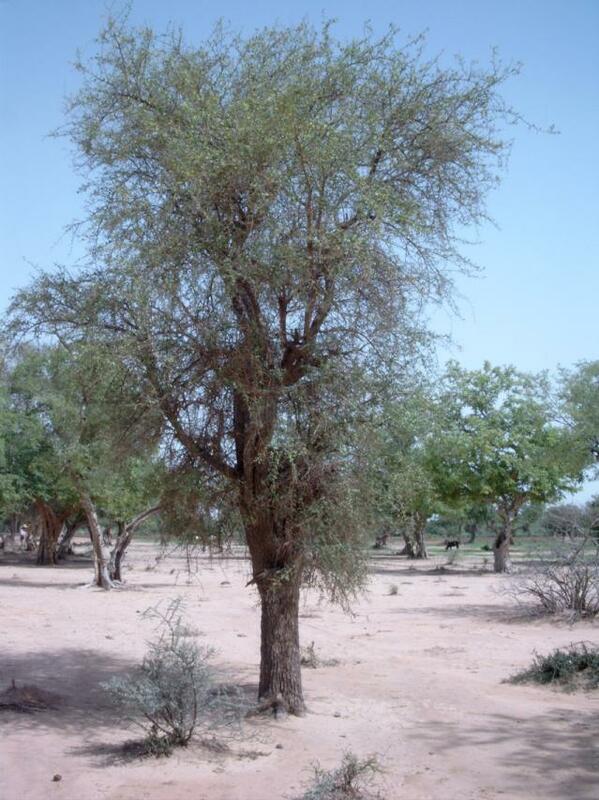 It is drought-hardy and mentioned as a possible agroforestry species. The tree withstands grass fires. It can run wild in abundant environments and become a weed (Ecocrop, 2009). An emulsion made from the fruit or bark is used as a molluscoid and fish poison. The toxicity is due to a saponin that becomes rapidly inert so that fish killed such this way are edible. Nevertheless it was reported in Côte d’Ivoire that the saponin damages the sight of fishermen after they have used it for five or six years (Orwa et al., 2009). The green leaves, and particularly the green shoots, are commonly used as animal forage. They are sought after by sheep, goats and cattle, and are especially relished by camels. Shed, dried leaves are also sought after by camels and sheep. Camels may browse on this species up to 18-19 hours a day, ingesting 1.7 to 1.8 kg of fresh matter (Baumer, 1983). The tree is lopped for fodder in India. Balanites aegyptiacus could contribute up to 38% of the dry matter intake of goats in the dry season in Burkina Faso (Orwa et al., 2009). The crude protein content is the highest during the wet season. Digestibility values for crude protein, dry matter and organic matter are higher than for Combretum aculeatum or Leucaena leucocephala in sheep at any stage. It is good forage especially when the tree is sprouting new leaves and new fruits (Kaboré-Zoungrana et al., 2008). It is also a good source of degradable protein though it needs mineral supplementation (Fadel Elseed et al., 2002) since it is poor in P and Cu (Mtui et al., 2008). The fruit is appreciated by all livestock. Sheep and goats spit out the stones, but cattle swallow them several times during rumination, and camels swallow them after crushing with their teeth (Baumer, 1983). The meal remaining after oil extraction from the fruits is widely used in Senegal, Sudan and Uganda as a stock feed (Orwa et al., 2009). Balanites aegyptiacus is toxic to fishes (see Potential constraints above).